Japan Airlines and All Nippon Airways dovetailed their 1H2014 (the six months to 30-Sep-2014) performance. JAL, which gained fewer Tokyo Haneda slots than ANA, had a more stable international performance but also less international growth. Both airlines cut domestic capacity (JAL more so than ANA) and experienced yield decreases but higher load factors. Both also now admit Japan's consumption tax increase has impacted domestic demand. JAL, expecting a lift from lower fuel prices, is raising its full-year forecast while ANA is retaining its forecast. 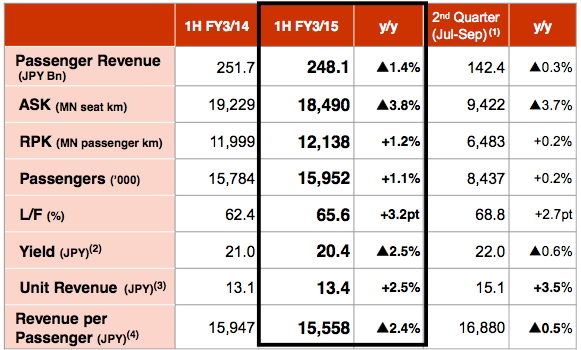 JAL now expects an enviable 11.8% operating margin. The balance of the year will see JAL take control of small regional carrier Hokkaido Air System and resume service between Osaka Kansai and Los Angeles. JAL is still considering a return to Latin America with its own metal, and as an initial step will codeshare with new oneworld partner TAM. This adds to its existing Latin America codeshares with American Airlines and LAN. 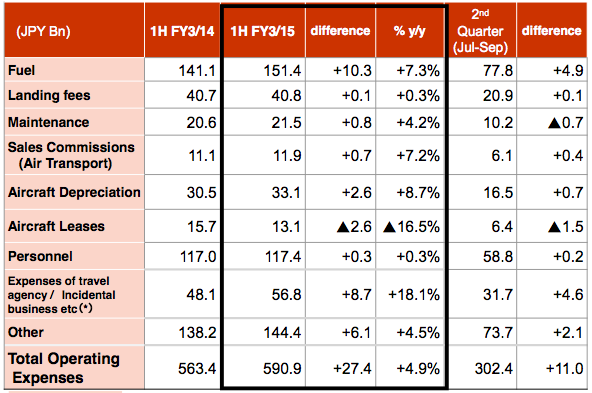 Lower fuel prices have caused JAL to improve its FY2014 outlook. JAL has raised its operating profit 18% and expects its operating margin to be 1.4ppt higher at 11.8%. Net profit will be up 20%. JAL will likely have the highest margin in Asia amongst large airlines. Driving the profit revision is a projected 28% decrease in operating expenses, lead by lower fuel prices. JAL now projects Singapore kerosene to be USD118.7/bbl, down from its previous forecast of USD125. JAL expects Dubai crude to be USD105.1, down from its previous forecast of USD107. 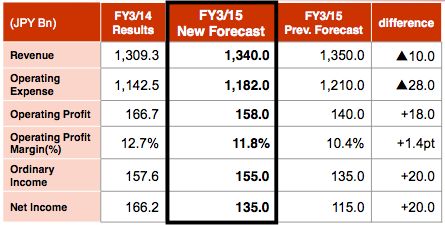 JAL's forecast also includes a 10% decline in revenue. 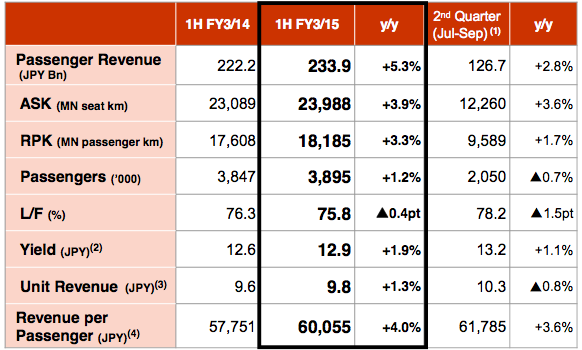 However, JAL does not project a decline in passenger or cargo revenue. Rather the decline is in JAL's "other" category, and the decline is caused by lower revenue expected from fuel re-sale contracts. Before JAL looks forward to a brighter full-year result, it first faces a weaker 1H2014. Operating profit declined 3.1% as 3.7% revenue growth was outpaced by a 4.9% increase in operating costs. But JAL still enjoyed one of the best positions in Asia with a 13.6% operating margin, although this is down from 14.5% a year prior. Net profit: JPY135 billion (USD1311 million), +17.4%. The air transport revenue growth of 3.4% was faster than the RPK increase of 2.4%, which in turn was faster than the 0.4% increase in ASKs. Operating expenses grew an unwelcome 4.9%, with the bulk of the gains caused by more expensive fuel as a result of recent depreciation of the yen. This impacted JAL's fuel costs but also its incidental business area, which sells fuel to related parties. The yen's depreciation brings some revenue lift, but this benefit represented only about a third of the yen's depreciation impact on costs, meaning the yen's overall impact was negative. ANA's 22.5% increase in ASKs compares to JAL's far more moderate 3.9% increase. As a result of ANA's swift expansion programme, unit revenue and load factors decreased. JAL however saw a small 0.4ppt decrease in load factor but gains in unit revenue and larger yield gains than ANA. However, if given the choice, JAL would have preferred some short-term pain from an expanded international programme if it meant it was given more international slots. Although ANA is capturing the attention in the area of international expansion, JAL is growing, albeit more quietly. JAL has announced it will return to the Osaka Kansai-Los Angeles market before the end of FY2014 (the year to 31-Mar-2015). This is part of JAL's medium-term plan to decrease its presence in the domestic market. ANA has a similar objective but is also aiming to significantly grow its international network. ANA's international network is larger than JAL's, and ANA expects in FY2015 to have a larger international than domestic network for the first time in its history. In comparison, JAL has long had a larger international than domestic market. A small development in the domestic market is that JAL intends to make small regional carrier Hokkaido Air System a subsidiary of JAL once again. JAL will increase its stake in HAC, as the carrier is known, from 14.49% to 51.23%. One of JAL's international development strategies is to enlarge its presence in the Latin American market. JAL no longer serves Latin America with its own metal (tag flights to Mexico City and Sao Paulo have long gone) but is exploring a re-entry. Japan is home to some of the largest Asia-Latin America traffic flows, driven by Japanese communities in Brazil and Peru. JAL also has the potential opportunity to tap into growing manufacturing (Japanese car factories in Mexico, for example) and connecting traffic opportunities. The Asia-Latin America market was a recent focus of CAPA's strategy journal Airline Leader. Partnerships and joint ventures reign in Japan: ANA's entire long-haul network is covered by JVs (Lufthansa Group to Europe, United to North America) and almost all of JAL's long-haul network is covered by JVs (Sydney is not; Europe is covered by British Airways and Finnair while North America is covered by American Airlines). At first blush it seems ideal for JAL to reach Latin America with partnerships. JAL already codeshares with American Airlines and LAN, with JAL handing passengers at gateway North American cities (LAN and TAM do not serve Asia). In Nov-2014 JAL and TAM applied to codeshare, facilitated by TAM's joining of oneworld earlier in 2014. Subject to approval, TAM will codeshare on JAL's Tokyo-New York service while JAL will codeshare on TAM's New York-Sao Paulo/Rio de Janeiro service, as well as Los Angeles-Sao Paulo, although TAM does not operate between Los Angeles and Sao Paulo. However, the Japanese market is in many respects unique, and one such characteristic is that the market will pay a very handsome premium to fly a Japanese carrier over a foreign carrier. With sufficient demand between Japan and Brazil, and JAL now having a lower cost base, it could very well return to Brazil with its own fifth freedom service. JAL has said it will test the waters with partnerships. JAL would not want to miscalculate a route entry, let alone one it previously exited. This small example perhaps reflects today's JAL: a leaner and more conservative carrier looking for modest international growth opportunities. It will be overshadowed by ANA – if it is not already – but will achieve the double digit operating margins so many carriers around the world have found elusive.